Jamie's interest in Earth science was sown in his home province of British Columbia. He was inspired to study geology at the post-secondary level by his grade 12 Geology class at Kalamalka Secondary School in Vernon, B.C. He moved to Edmonton to obtain his honours degree at the University of Alberta in 2002-2006. 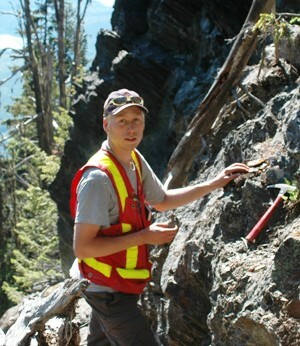 While at U of A, he was introduced to Cordilleran field geology as the field assistant of former Ph.D. candidate Yvon Lemieux, and he expanded his field experience as a member of the Geological Survey of Canada's Boothia Peninsula Integrated Geoscience Project in Precambrian rocks in central Nunavut. His honours thesis, supervised by Dr. Tom Chacko, described and quantified for the first time the stratigraphy and tectonometamorphism of a Paleoproterozoic supracrustal belt in the northern Rae Domain, Nunavut. Upon graduating, he immediately began field work near Revelstoke, southeastern British Columbia for a M.Sc. at U of A under the supervision of Dr. Philippe Erdmer and in collaboration with the Geological Survey of Canada under the auspices of the Targeted Geoscience Initiatives 3 - Cordillera project. In 2007 he decided that couldn't get enough of Selkirk Mountain geology so he transferred to the Ph.D. program. My thesis aims to improve our understanding of the Paleozoic evolution of the distal Cordilleran margin that is presently represented by deformed and variably metamorphosed volcanic and sedimentary successions in the Selkirk Mountains near Revelstoke and Trout Lake, British Columbia. I hope to resolve several important questions of Cordilleran geology such as “Why does the lower Paleozoic distal margin record tectonic instability while the coeval shelf was a passive margin?” and “Did hypothesized Devono-Mississippian deformation in the southern Canadian Cordillera actually occur, and, if so, what caused it?” Through field investigations and geochemistry, I will estimate the tectonic settings of and potential for syn-depositional sulphide deposits within the studied strata.